An exactly engineered bespoke hand cut stencil with an Art Deco feel compliments the period furniture and ornament in this London study. The colour of each lozenge was hand mixed during application giving a large variety of tone and colour within the overall scheme. 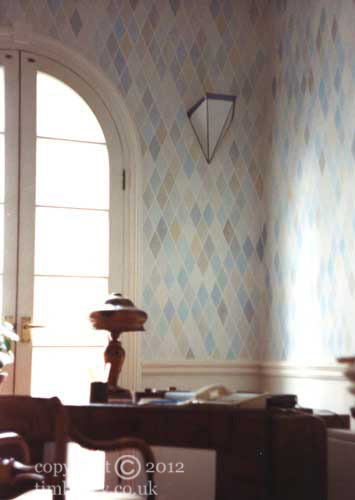 Stencil use in specialist decorating provides opportunity for large repeating designs. Considerable variety may be introduced within the repeat because they are hand worked. This variation over a wall surface takes the work away from the uniformity of wall paper and into the realm of the art wall or mural. All colours can be judiciously mixed to provide a link to fabric treatments and items of furniture. The work is in London U.K. and was commissioned by an interior designer.